Arriving at Windhoek International airport your rental vehicle is ready for you to be taken over or your guide is awaiting you. Depending on the rental company booked, you will either be transferred to town to take over the vehicle or you can take it over at the airport directly, the main criteria are availability and price. 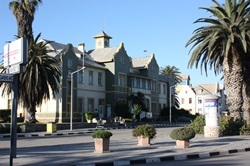 Namibia’s most sought after holiday destination is definitely Swakopmund but seeing that you are not here for sightseeing you continue to the neighboring town Walvis Bay, known for perfect conditions if the wind is blowing to do some wind surfing. Should the wind not be blowing or you would prefer to try some surfing, paragliding, quad biking, go-karting, sky diving, sand boarding or would prefer to explore the ocean or the desert and its creatures than you have plenty to do during your stay. Wow this was exhausting but fun wasn’t it. 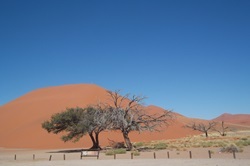 Now it's time for some sightseeing including your daily workout at the world famous Sossusvlei where your accommodation is permanent tents with stunning views over the desert plains. Driving via Kuiseb and Ghaub pass it might be time for stunning photos or continuing to Solitaire a cup of coffee and a piece of apple crumble, known far over the borders of Namibia. Having recharged your power supply continue to your accommodation, maybe take a dip in the pool and than climb down into the Sesriem Canyon and explore the gorges and permanent water pools at the bottom. On the morning of day 8 an early start is advised. Whether you want to do hot air ballooning to see this breath-taking landscape from a bird eyes view or drive into the Sossusvlei and explore the clay pans, is totally up to you. The sportsman in you will want to climb up Dune 45 and visit Dead Vlei on foot, which will surely be enough workout for the day. Should all this not be enough workout you can join a 3 days / 2 nights desert hike in the NamibRand Nature Reserve in the aftermath. Leaving the heart of the oldest desert in the world you road takes you south for some extreme activities in the Atlantic Ocean. 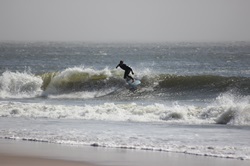 Once again optional activities like kite surfing, wind surfing, surfing, stand up paddling, penguin cruise, cycling tours and a visit to the ghost town Kolmanskop are on the menu. For 4 full days you can workout into all directions. Maybe by the time you are travelling the climbing wall as well as day trips with the bicycle are in the program as well. All activities should be pre-booked in order to make sure that you will be able to obtain the full gear should you not have your own. If you have your own gear all you need would be the instructor or someone to take you to the spots that you need to race with the wind. Here in Luderitz the world speed weeks are held every year so it will be your opportunity to tread into the footprints of big stars of the waves. By now you have had the most of your workout for the time being since now the program switches to some cultural experience and wildlife. By now your body will be really swept from all the stress and energy is on top level, the ideal start to go and learn more about some romantic acts from World War 1. 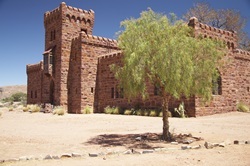 Visit a desert castle near Maltahöhe and learn about the romantic history of this castle built out of love to a woman. If you are lucky and the farmer can take you, you can also pay a visit to the most gentle and well-mannered ostrich there is in this area. He will even dance for you if he likes you. 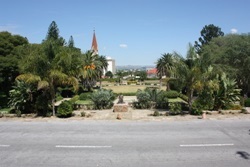 A short stop along your route north, just for one night is planned for Swakopmund again. Enjoy a last walk on the beach or join a township tour in the afternoon or if the dare devil in you awoke, go for a tandem or single skydiving session. A race on the go kart track would also be a possibility to raise your adrenaline level. In the evening one of Swakopmund’s sumptuous seafood restaurants will be your host for sure. This time you are leaving the beach of the Atlantic coast for good. There are two ways to reach today’s destination in the Damaraland. The first option is to drive via the highest mountain in Namibia, the Brandberg and its world famous bushmen painting the “White Lady”. 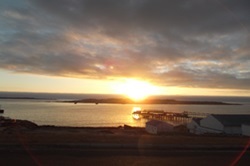 The second alternative is to drive up the coast, visit the largest cape fur seal colony at Cape Cross and continue via the Skeleton Coast Park into the Damaraland. Both routes have something extraordinary though so very different. Reaching your destination in the gravel plains of the Damaraland there might be some time to do sightseeing or you just settle yourself on the terrace of your accommodation and enjoy the marvelous surrounding sipping an ice cold glass of wine or beer. Tomorrow your day is filled with sightseeing and as you chose an active holiday a workout is planned as well. 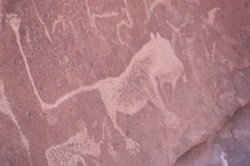 Visiting the rock engravings of Namibia’s first world heritage, means joining a local guide on a 45 minute walk into the rocks of Twyfelfontein. Also worth a visit are the Organ Pipes, Burnt Mountain and not to forget the Petrified Forest close to Khorixas. 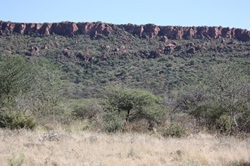 If all this was not enough exercise yet, why not visit the Living Museum of the Damara where you can join a local guide for a walk into the bushfeld, experiencing how these little people, ancestors of the Bushmen, learnt to survive in this unfriendly and harsh surrounding. The following 3 days are all in the flair of game viewing and wildlife. Reaching your accommodation 10km before the gate of Etosha National Park you can check in and then go for your first game drive in the park. Etosha National Park offers many natural and artificial water holes for you to visit to try your luck viewing 4 of the Big five which is lion, elephant, leopard and cheetah. If you are very lucky you might even see hyena, snake and scorpion but surely some eagle and other bird species can be viewed. It is not only the water holes that might offer you the craved sight but also every bush or grass bundle that might cover your sight from a lion, cheetah, leopard, wild cat, snake or whatever hides from your eyes. In Etosha National Park the main focus is being alert and driving slowly along the scraped roads always watching the bush on both sides of the road. 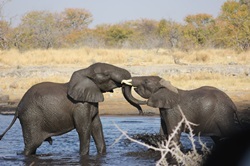 During midday heat the waterholes might be promising for elephant that love to play in water like little kids or even far away from any water just roaming through the bush another grey animal with bad eye sight, the rhino, might cross your path. Close to sunrise or sunset predator are likely to be seen. Since your lodge offers breakfast baskets you should take one along so that you can enjoy a delicious breakfast in the company of maybe some lion. 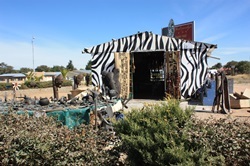 In the evening enjoy the shebeen like restaurant and some lovely food and wine to relax under a astounding sky full of stars. These two days are filled with astonishing flora and fauna as well as the possibility to work out while hiking to the top of the Waterberg Plateau and viewing the most beautiful butterflies and trees as well as unseen flowers growing wild at the foot of the Waterberg Plateau. Here you are caught in an unreal world amidst the grassland of the surrounding. Join the local guides for a drive on top of the plateau viewing wildlife you might not have seen before since they are bread for spreading in this nature park. I know it is unbelievable but your stay has come to an end and you have to return to Windhoek for your late afternoon flight home. On your way to the airport you might want to buy some last souvenirs or crafts for your loved ones and you have a unique opportunity for this at the craft market in Okahandja. Then return to your rental company, return the vehicle and either check in or take a transfer to the airport to check in. If this is your kind of holiday but it is too long, than just let us know and we tailor make a visit for you, just as long as you can afford. On the other hand this kind of holiday is extendable to whatever length you want us to extend it to and we promise you one thing, you will never get bored.